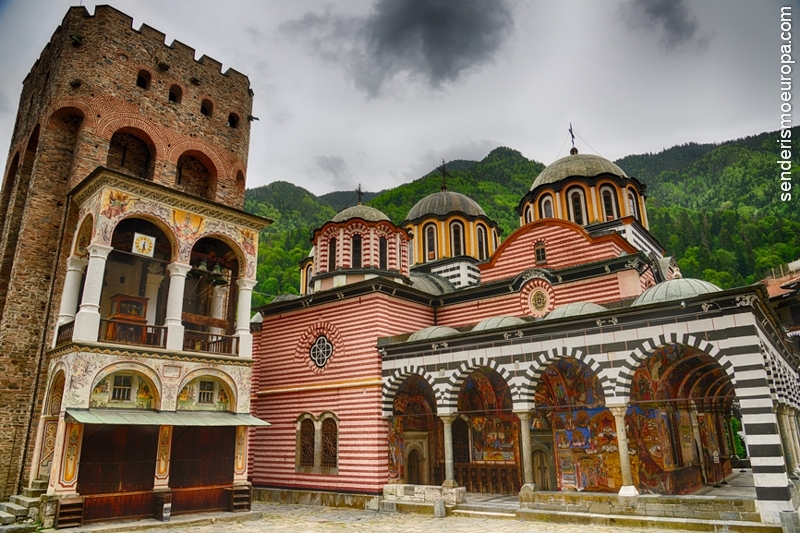 Rila Monastery in Bulgaria is within the National Park Rila . It is in a mountainous area 1.150 meters, in fact the monastery walls are surrounded by wooded hills, multicolored green in summer and when they fall colors. It is distant from Sofia, the capital of Bulgaria, within 125 km, most highway route to get there is but the last stretch is mountain road in winter so be sure before climbing the road is clear of snow. History of Rila Monastery in Bulgaria: It was founded in the tenth century by Ivan Rilski (Ivan de Rila) and his disciples, Ivan Rilski it is considered the first hermit in Bulgaria, He lived for years in a cave near the monastery, cave that can be visited on a short but very nice route crossing a nearby forest. After Ivan Rilski, con ayuda de algunos discípulos fundó el Monasterio. It has always been a cultural and spiritual center that despite the 5 centuries of Ottoman occupation that Bulgaria suffered from the century 14 and he 19, He helped preserve culture, religion and preventing Bulgarian traditions were lost. In the fourteenth century the fortress tower that still remains was constructed, and during that century the monastery reached its peak as feudal entity with power over many towns and nearby lands. Talented writers, painters, woodworking teachers and other arts left fascinating manuscripts, frescoes of high artistic value, notable works of art in wood, icons and many other pieces of art; Monastery was similar to those of Western Europe Palacios functions and was where the best artists and artisans of the country developed their work. The fall of Bulgaria under Ottoman yoke from 1.396 This artistic development stopped, but the monastery and its monks knew protect Bulgarian culture and original tradition within its walls even though the Ottomans prevented further develop their spiritual action Bulgarians. Over the centuries it suffered fires and major damage. The current image of the monastery is of the eighteenth and nineteenth centuries when it was rebuilt and renovated after the expulsion of the Ottomans. 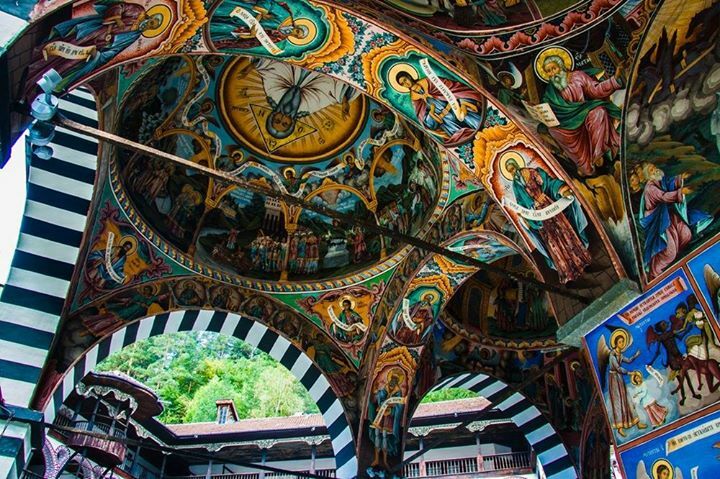 Current situation: Rila Monastery in Bulgaria you can visit every day and has become the main tour for visitors to the capital, Sofia, either in search of culture and traditions or assets with an aesthetic that is unknown in Western Europe. In fact it is one of the 9 objects in Bulgaria which is UNESCO World Heritage. You can see the rest of Bulgaria sites which are UNESCO World Heritage here. The current complex includes religious buildings, and museums in a residential area 8.800 m2. The outer boundary is formed by walls 24 meters in the form of irregular pentagon, This is because the monastery was originally conceived as a fortress into which is accessed only by two inputs. The interior houses the medieval fortress tower 1335 (Torre Jreliyova), a small church 1335, the main church 1837 from 5 domes, several small churches, buildings for accommodation 300 monastic cells, 4 chapels, a refectory, a kitchen in a building 22 meters high, a library with manuscripts of the tenth century to the nineteenth, 30 richly decorated guest rooms, a museum and the most visited, a large central courtyard that gives access to all these buildings. 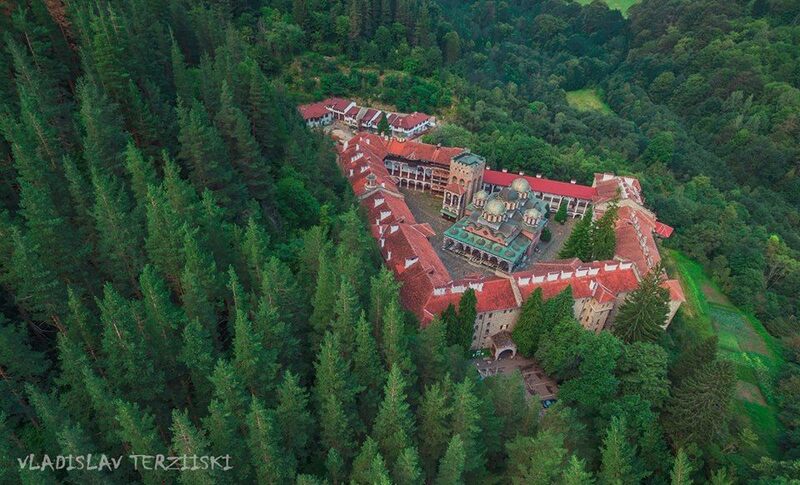 However if you want to know more about this monastery and learn some places “secrets” not listed in the guidebooks can read another of our articles on this monastery: Monasteries of Rila: secret corners. In this article we talked for example Monastery Bakery, where you can buy homemade breads and scones “mekitsi” they are the best in Bulgaria. 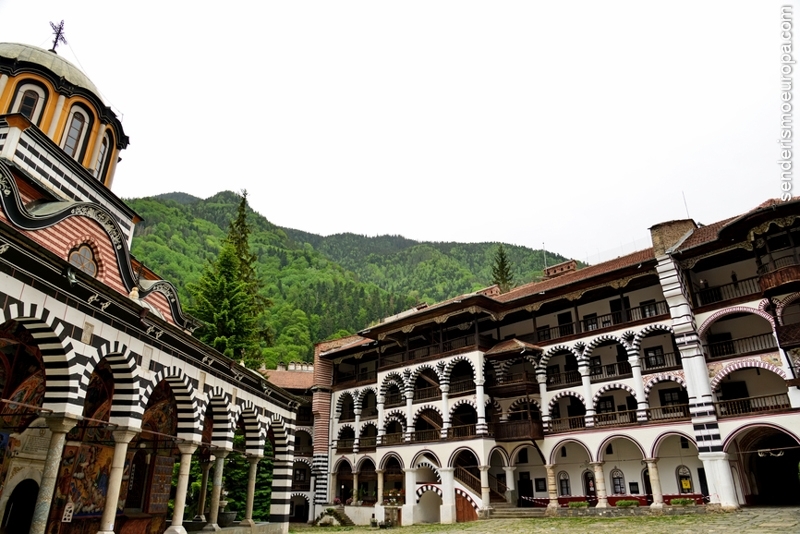 To be within the National Park Rila, Rila Monastery is the starting point of numerous hiking trails to nearby mountains. 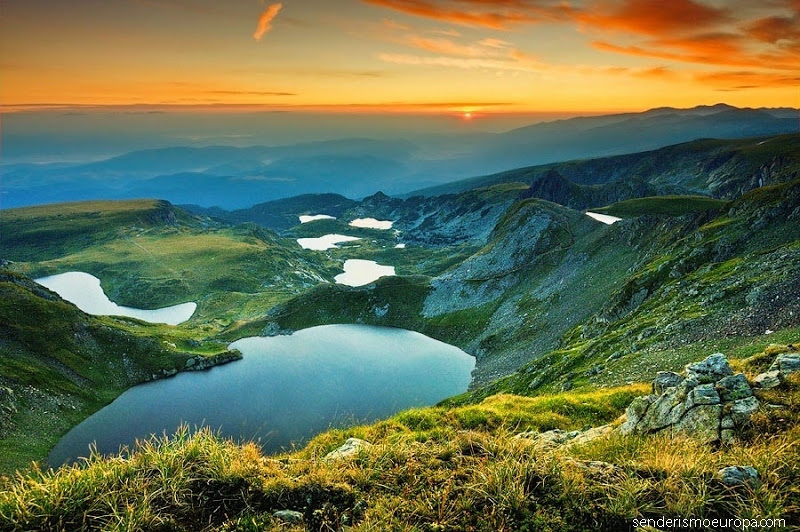 In the vicinity, only 8 km, They are also famous 7 Glacial lakes of Rila which will be the subject of a future article in this blog, a 21 km is the peak Musala (2.925 meters high) that is the highest of all the Balkans and many other natural attractions that make the region an ideal destination hikers Europe. 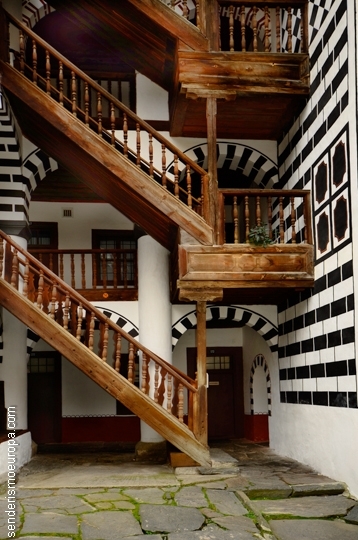 From the Rila Monastery you can also walk to the cave where he lived alone for years Ivan Rilski (Ivan de Rila). The monastery is open for visitors 7.00 a 20.00 hours all year. These are the official times, We are warned though that the Ethnographic Museum is usually closed except in summer. Museum of Church History does meet the schedule Summer and Winter indicating up. family fertilizer (Parents with children) 3 BGN per adult and 1 BGN for a child. From Sofia take the motorway A3 towards Greece and halfway out of the highway (There is a sign on the highway itself announcing the turnoff to the Monastery). Then follow the regional road passing through the towns of Pastra and Rila Monastery to reach. The last stretch is mountain road but, thanks to tourism, It is well paved, unlike other regional roads in the country… If you go by rental car we recommend you read our article on “Travelling by car from Bulgaria“. Monastery offers accommodation, It has some monastic cells adapted for visitors. is only requirement being married if you want to take one of them as a couple. To book is necessary to contact the phone and request monastery (but only they speak in Bulgarian). If you think viajar a Bulgaria, It accounts with us and we will prepare a customized itinerary may include a visit to the Rila Monastery and other activities of active tourism. 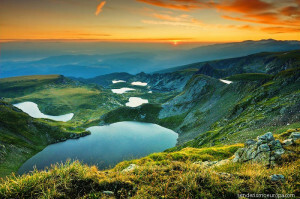 You can be accompanied by a local guide-translator that will reveal all the secrets and attractions of Bulgaria still know most tourists from Western Europe, or make your air travel by rental car and luxury hotels reserved for us. I read in this article that the Rila Monastery is open all year, but when is the best time to visit?